From onboarding new employees to conflict resolution, increasing team morale to deepening relationships in long-standing groups, team building is an integral way to maintain effective teams. Going further, understanding the strengths and behavioral patterns of each member is at the core of developing meaningful relationships that increase group synergy, drive performance, and lead to organizational success. One of the most useful tools to use in team building sessions is a multi-dimensional personality assessment to establish an unbiased language and framework used to discuss each person's unique personality style. If you use this tool in your team building activity or session, you will need to research the different assessments available—just as different teams accomplish specific goals, different behavioral assessments achieve different goals. We've compiled some questions you need to consider in your search for a personality assessment. 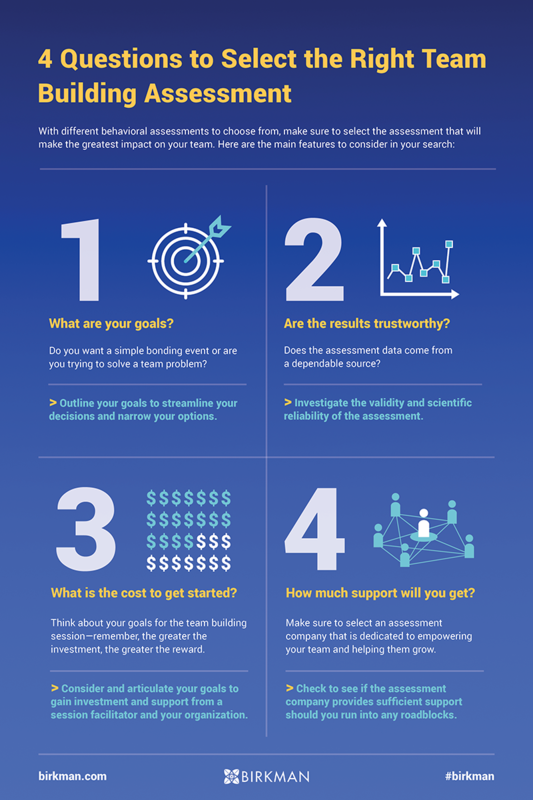 Take a look at this infographic to get the best results as you empower your organization through team building activities. This topic is featured in the second of our three part Team Building eBook series to help you get all the information you’ll need to select an assessment so you can save time and focus on what matters most—your team members. Download the eBook today. Check out other blog posts from Birkman. Never Miss the Perception Connections Blog!